The Jump Drive allows for instantaneous relocation to a distant location. Once activated, the block initiates a short countdown, then stretches the screen and teleports the ship to its new coordinates. This is faster-than-light (FTL) capability. The Jump Drive is only available for large grids. It is 3x3x2. Before use it must be charged like a battery; maximum storage is 3.00MWh, and its maximum charge rate is 32MW. Thus, it should take 5 minutes and 38 seconds to charge if power is not restricted. Once fully charged, the block can be activated to jump. This will expend stored energy. Jump distance is proportional to energy expended and inversely proportional to the mass of the ship. Multiple drives may be combined to extend range. 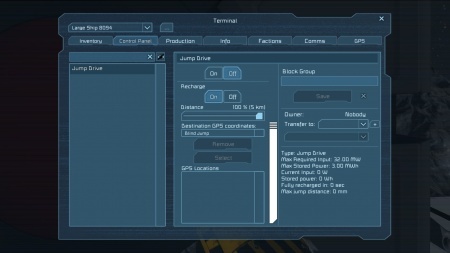 Jump drives will not activate unless there is at least one drive on the ship at 100% charge (making multiple consecutive jumps require additional, preserved drives), will not jump the ship less than 5000 meters, and will not jump within 2km of any object (attempting to do so will result in a shortened jump). 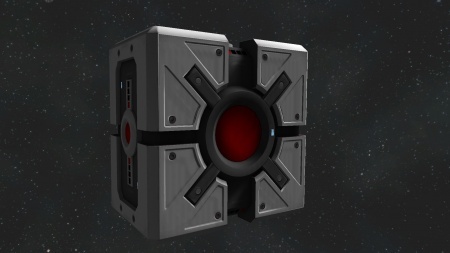 The Jump drive will not activate if the ship is attached to a station or anything immobile such as stations attached to or embedded in asteroids. In addition, the Jump Drive will not activate if it or any part of the ship it's apart of is currently within at least 0.05 G of natural gravity (eg. a Planet); nor can it jump into such a natural gravitational field. The jump must be activated from a "main" cockpit, by use of a toolbar, and will start a short countdown. The jump may be aborted by turning off the jump drive, but the energy will still be lost. The jump may be a "blind jump", in which the ship advances X meters forward in whatever direction it happens to be facing (relax; you can't jump into anything), or a jump to/towards a GPS point. Configuration is done through the control panel and activation is done from the cockpit toolbar. Ships attached by connector or landing gear will be dragged along for the ride, as will any astronauts in cockpits, control stations, flight seats, or passenger seats. Any ship or astronaut not so connected will be left behind, regardless of whether they were inside an enclosed space, so watch that you do not accidentally leave friends or equipment behind. Calculation of energy costs and maximum distance and designation of which blocks will jump appears to be done when the jump command is given. A ship docking after the countdown begins but before the jump will be left behind. This prevents obtaining a cheap jump by activating a drive on a smaller ship then engaging landing gear connecting it to a large one. What does this mean in terms of uranium? Charging a jump drive from empty to fully charged requires 3.0 kilograms of Uranium Ingots. A default red ship (2,585,761 kilograms) can go 1933.67 kilometers on its two jump drives (6 MWh, total). This indicates a cost of 1.2*10^-12 MWh/(kg*m). Translated: moving one million kilograms of ship the minimum jump distance of 5km requires 0.314 kilograms of uranium ingots. One uranium ingot will get a million kilos of ship 15,916.69 meters. Any ship that has mass equal to or less than 1,250,000 kilograms has a maximum jump distance of 2000 kilometers for each fully charged Jump Drive it has. Please note that this means that, for example, a ship with mass of 200,000 kg and a ship with mass of 1,250,000 kg (Nearly six times greater mass) will be able to jump the same maximum distance and will be consuming the same amount of power for jumping the same distance. Any ship that has mass greater than 1,250,000 kilograms will have its maximum jump distance reduced (from the maximum of 2000 km for each fully charged Jump Drive) depending on the mass of the ship, in a non-linear fashion. The reduction of maximum jump distance is steeper for ships with less mass (closer to 1,250,000 kg), and much less steep for ships with more mass (approaching 2,500,000 kg). Note that these values are for one Jump Drive. For multiple Jump Drives the values scale linearly, meaning that the ship of the same mass, but with two Jump Drives, will be able to jump twice the distance than what the graph shows, and a ship with three Jump Drives three times the distance, etc. These values have been acquired by precise in-game testing and then graphed. After jumping any distance with the Jump Drive, you cannot jump again until fully recharged. However, since the power drained from the Jump Drive is proportional to the distance of your jump divided by the maximum jump distance, you can jump around multiple times with short recharge times if you make smaller leaps. This page was last modified on 20 October 2018, at 17:37.